The patient above is an example of a smile makeover involving most of the upper teeth. 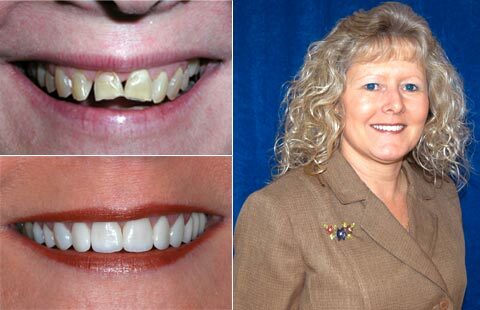 It involved minor orthodontic (braces) treatment to align the teeth and then a combination of metal free crowns, porcelain fused to metal cemented bridges, and porcelain laminate veneers to achieve the nice result displayed here. 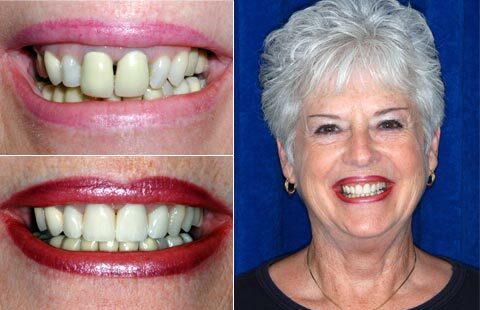 The patient’s treatment below only involved four teeth being treated with metal free crowns to achieve the dramatic change she desired. Each case required careful planning to determine the treatment needed to achieve the desired change. As you can see dramatic results can be achieved whether the case is complex or simple if careful planning is followed by attention to detail when implementing the planned treatment. These are the principles on which we build each case to the very best of our ability.